It is to be noted that when no full preterists responded to his article immediately, he posted that the failure to respond must prove that preterists know that they cannot answer the article, thus proving that we supposedly surrender our position. Well, on 7-26-18, I posted the first of what is, with this article, five responses to Mr. Vincent’s article. His response? Total silence. Not a key stroke. When I posted -several times just recently – reminding Mr. Vincent that he had failed to respond, Mr. Vincent simply urged me to be patient. And yet, still not a word! The reader needs to realize that not only has Mr. Vincent’s article been answered, but, that, as of this posting, he has still not offered a syllable of response to even one of my articles. So, we will continue our Responding to the Critics series, in response to Mr. Vincent. 1. I have shown that Revelation posits the entrance into the MHP at the time of the judgment of the city where the Lord was crucified- Old Covenant Jerusalem. 2. I have shown that this means that the Law of Moses did not come to an end at the cross, but, in AD 70, since Hebrews shows that there could be no entrance into the MHP while Torah was imposed. 3. I have shown that Revelation 11 predicted the fulfillment of Psalms 110, and that it would be in AD 70. 4. I have shown that Revelation 11 and Revelation 20 are directly and perfectly parallel. This demands that the end of the Millennium resurrection occurred at the destruction of Jerusalem – the Great Day of the Lord’s Wrath. More on this in an upcoming series on the end of the Millennium. I have shown that the “until” passage of Revelation 15:8- no man could enter the MHP until the judgment of Babylon – when harmonized with the rest of the Apocalypse (and Acts and Corinthians and Hebrews) provides definitive, powerful proof that Psalms 110 was fulfilled at the judgment of Old Covenant Jerusalem in AD 70. With this summary in mind, let’s go back to 1 Corinthians 15 for a moment. Remember that Paul said the resurrection would be when “the law” that was the strength of sin” would be put away. This is the “destruction of the power of the holy people” (Israel’s covenant with YHVH) at the time of the resurrection of Daniel 12:2-7. And make no mistake, contra some attempts to redefine “the law” that was the strength of sin as “the law of sin and death,” in the Pauline epistles, “the law” that was the strength of sin was Torah, the Law of Moses. Paul uses the term “the law” some 128 times in the NT. In all but a handful of times, and those clearly defined, that reference is to Torah, the Law of Moses. Sometimes, Paul can use the term “the law” to refer to the Gospel “the law of the Spirit of life in Christ” (Romans 8:1-3, cf. Galatians 6- “the law of Christ”). But that is patently not calling the Gospel the strength of sin! The Gospel makes a person free from the Law of Sin and Death – Torah could never do that. Instead, Paul knew that while the Law was good, and holy and spiritual, and indeed, it was “intended to give life” the reality was that it brought death. It “enforced” and exacerbated the Law of Sin and Death: “I had not known sin except the Law had said, ‘Thou shalt not covet’” (Romans 7:7f). The Law of Moses was the strength of sin. Scoffers such as Sam Frost and futurists know that if Torah was the law that was the strength of sin their futurist paradigm is lost. But, they cannot demonstrate exegetically that any law other than Torah was the strength of sin. ✘ No where does scripture describe the law of sin and death as the strength of sin. ✘ No where does scripture say that the law of sin and death was intended for life, but brought death instead. ✘ No where are we told that the law of sin and death informed of sin, defined sin. It was Torah itself that informed of sin and condemned. It was the Law of Moses that was intended for life, but, brought the law of sin and death to bear by pointing out violations of the Law. The law that was the strength of sin would remain valid until the resurrection, when it would be removed (1 Corinthians 15:55-56). The law that was the strength of sin was the Law of Moses. Therefore, the Law of Moses will remain valid until the resurrection. Interestingly in my two formal debates with Dr. David Hester, of Faulkner University in Montgomery, Alabama, (2016, held in Ardmore, Ok. & 2017) he initially admitted, in writing, that “the law” that was the strength of sin was in fact, “the Law of Moses.” However, when I presented this argument repeatedly, he then changed his position and denied that “the law” that was the strength of sin was Torah. When I took note of this “mid-debate” conversion, he refused to discuss the issue further. Total silence! (DVDs and a book of our first debate are available from me. 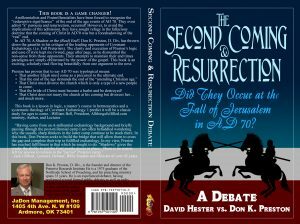 Dr. Hester gave publishing rights to the second debate to a publisher, but, to this date, well over a year after the second debate, I am unaware of any publication of that debate). 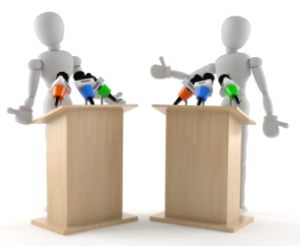 A formal debate on the resurrection! The definition of “the law” that was the strength of sin as Torah, agrees perfectly with Hebrews 9:6-10, where we are told that as long as Torah remained imposed (epikeimai), there could be no forgiveness of sin, no entrance into the MHP. Now, entrance into the MHP is nothing less than the restoration to the Presence of God. It is salvation; it is resurrection! That would come at the “second appearing” of Christ for salvation – the fulfillment of Psalms 110. And let us not forget that Hebrews 10:37 said that Christ’s coming was to be in “a very, very little while, and without delay.” (As noted, it is often claimed that the Law of Moses ended at the cross, but, that is untenable. See my book, The End of the Law of Moses: Torah to Telos for a full discussion). 1. He is imposing his concept of the last enemy onto the texts, and insisting that since physical death was not destroyed in AD 70, that therefore, Psalms 110 could not have been fulfilled. 2. However, in this hermeneutic, Vincent must be highly selective in his choice of the until passages, since numerous until passages posit the first century saints living until the parousia and resurrection. 4. Mr. Vincent’s selective use of the until passages demands that he creates two comings of the Lord to destroy his enemies, two judgments, two resurrections for the rewarding of the dead, two times of salvation. 5. Mr. Vincent must ignore the connections between Luke 19, Psalms 110, Revelation 11 and Revelation 20. Or, he must provide a hermeneutically sound reason for divorcing those texts from one another. As shown above, you cannot divorce Revelation 11 from Revelation 20 and that virtually demands that Psalms 110, 1 Thessalonians 4, 1 Corinthians 15 and all resurrection texts were fulfilled in AD 70. 6. Mr. Vincent must show us how and why it is the case that the coming of Christ, in the kingdom, in judgment of all men, in the first century before all of that generation died, was not the fulfillment of Psalms 110. His suggestion that the Millennium began in AD 70 is untenable in light of the parallels between Revelation 11 and chapter 20. It cannot sustain close scrutiny, but that is beyond further discussion in this article. What we have presented is more than sufficient. What we have shown is that there is a consistent NT doctrine in regard to the until passages. That consistent message was that Christ had ascended to the right hand of the Majesty in the heavens. Enthroned there, he was ruling in the midst of his enemies, awaiting the time determined by the Father (Cf. Revelation 1:1-3) to come in judgment of his enemies, and to enter fully into his everlasting kingdom. That time of his coming in judgment, the kingdom and the resurrection is invariably stated to be near, at hand and coming quickly. The consistent use of the until passages proves that he came – and he rules!– in AD 70. 1. It must be proven that entrance into the Most Holy Place is unrelated to, disconnected from, the resurrection, the parousia of Christ, the judgment and rewarding of the dead – the time of salvation. 2. It must be proven that entrance into the MHP in Revelation is something totally different from entrance into the MHP depicted in Hebrews 9, which would occur at the end of the Old Covenant and at the parousia of Christ. 3. It must be proven that the resurrection, judgment and rewarding of the dead, the judgment of the nations in Revelation 11 is totally unrelated to Psalms 110. 4. It must be proven that Revelation 11, although it is the resurrection, the judgment and rewarding of the dead and the judgment of the nations, is in fact not the eschatological resurrection, judgment and rewarding of the dead, and the judgment of the nations. 5. It must be proven that Babylon of Revelation was not Old Covenant Jerusalem. Now, Frost has admitted for a good while that Babylon was in fact Jerusalem. But, I have also predicted that one of these days, he would reject that Biblically accurate position. I still believe that he will, given his ever changing constant vacillation on other subjects and texts. So, what we see in 1 Corinthians 15 is that Paul’s frame work for the fulfillment of the “until” aspect of the resurrection is clearly and unmistakably posited at the end of the Law of Moses. This is totally consistent with what we have seen in the previous four articles, and as we will see in the final article, the resurrection of Psalms 110 was to be fulfilled in the Great Day of God’s wrath. And that Day is irrefutably posited for AD 70. Stay tuned as we continue this Responding to the Critics series!